Click here for the full faculty and staff directory. Everyone can spot a Merion Mercy graduate. She is a young woman who is more than prepared for college, is confident in her unique abilities, and one who makes a difference through her contributions. That's why our students are sought after by the nation's finest colleges and universities. There's no mistaking that Merion Mercy Academy enjoys a reputation as one of the top premiere college preparatory institutions in the Delaware Valley. As an all-girls school we possess an understanding of how girls learn and provide an environment where girls thrive and grow in mind, body, and spirit. Our devoted faculty are forward-thinking teachers, mentors, and advisors who know the girls by name (10:1 student/teacher ratio and average class size of 16). Our educators are focused on the process of learning, rather than on just covering content, as well as on "differentiated instruction" which addresses the fact that all students do not learn in the same way. We are the only school in the area that utilizes a "hybrid schedule", offering the "best of both worlds" for today's learners. Within an 8-day cycle, students will have 6 days of eight periods (including lunch) and on 2 days they have just four extended periods; this permits more in-depth study of subjects, allows work time for individual or team projects, and provides a variety of creative classroom activities. Girls from MMA learn how to write effectively, eloquently, and persuasively. This is a rare skill today, and our students are often commended by college professors and industry leaders on their superior writing abilities - an asset in every career. 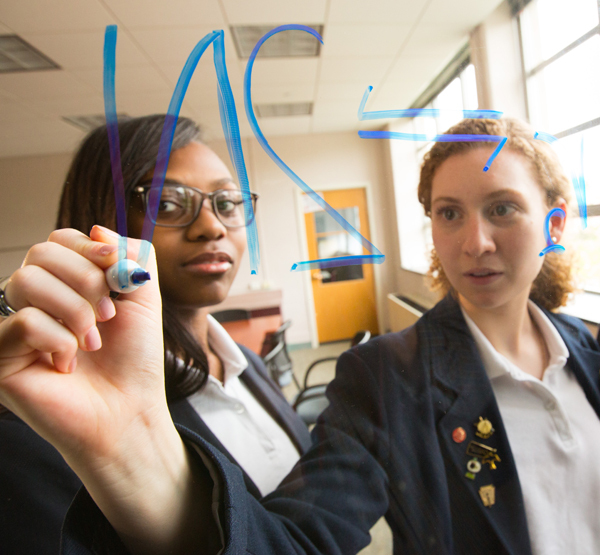 We teach critical thinking, strategic analysis, and problem-solving skills through our rigorous curriculum that includes STEAM initiatives and 17 AP courses. Merion Mercy is fully accredited by the Middle States Association of Colleges and Secondary Schools. We are also an active member of the Association of Delaware Valley Independent Schools, Independent School Management, National Association for College Admission Counseling, National Association of Independent Schools, National Association for College Admission Counseling, National Catholic Education Association, Network for Mercy Education, Pennsylvania Association for College Admission Counseling, and Pennsylvania Association of Independent Schools. Click here to view the end-of-year senior awards. Click here to view the end-of-year underclass awards.